Learn how to make reason — not fear, cynicism, or rage — the loudest voice in the room! Leave with the skills, tools, and knowledge to have meaningful political conversations that generate insights without ideological food fights. 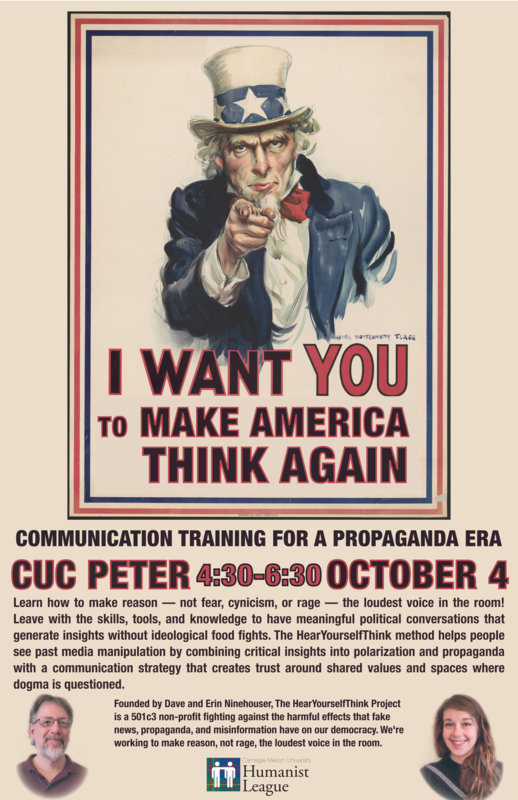 The HearYourselfThink method helps people see past media manipulation by combining critical insights into polarization and propaganda with a communication strategy that creates trust around shared values and spaces where dogma is questioned. Founded by Dave and Erin Ninehouser, The HearYourselfThink Project is a 501c3 non-profit fighting against the harmful effects that fake news, propaganda, and misinformation have on our democracy. We’re working to make reason, not rage, the loudest voice in the room.